London: Sphere Books Ltd, 1988. This is the second British edition published by Sphere Books Ltd. in 1988. This is the fifth book in the Tony Hillerman Navajo Mystery Series. The protagonist in this novel is Jim Chee, a detective from the Navajo Tribal Police. 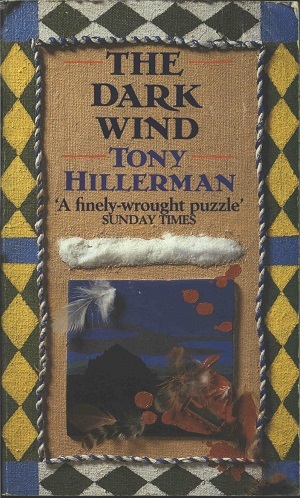 There are several Tony Hillerman novels published by Sphere Books Limited, and each of their covers follows a similar format: a multimedia collage, over a rough canvas base, that incorporates folk art elements and and items that indicate plot elements in The Dark Wind. In this case, a line of cocaine, a key plot element, is above a small oil painting of a dark Southwestern night sky. These elements are framed by blue and white course string embroidery, with a secondary framing device of a differently colored geometric diamond pattern. A smattering of blood and feathers, neither of which manifest in the novel, provide the finishing touches. Format: Paperback, 18 x 10.9 cm. Binding: Paper covers with a full color graphic on front cover. The title is printed in black horizontally on the spine and the author followed by the publishers device are printed below in blue and black, respectively, vertically on the spine.